There was a time you could hardly turn on a TV between Thanksgiving and Christmas without coming across the 1946 movie “It’s a Wonderful Life” — the one where Jimmy Stewart plays a frustrated small-town banker driven to the brink of suicide and saved by a quirky angel named Clarence. Those days are long gone, so Norfolk’s Naro Expanded Cinema is offering several screenings, part of a holiday tradition going back 40 years. 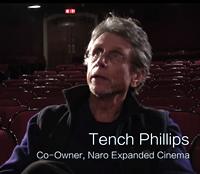 Thom Vourlas, co-owner of the Naro with Tench Phillips, remembers seeing the movie for the first time in the late 1960s or early ’70s. The young friends were at Phillips’ house on a Christmas Eve, and the movie came on the television, Vourlas said. He remembers his friend saying: “You’ve got to see this,” so they watched the movie, which poses the question: What would the world be like if you had never been born? For Stewart’s character, George Bailey, it turns out that the world, especially his little hometown of Bedford Falls and the people he loved the most, would have been much worse off. “It really touched a nerve,” Vourlas said. When he and Phillips opened the Naro in 1977 and winter was approaching, they thought, “Let’s play that movie for Christmas,” Vourlas said, but they couldn’t find a copy anywhere. Not realizing that the week between Christmas and New Year’s Day is the biggest of the year for selling movie tickets, they went ahead with their plan to take that week off to go skiing. They’ve learned a bit since then, he said, laughing. They became adept at finding films for their new art house theater. As they browsed a catalog of obscure 16 millimeter films, they saw “It’s a Wonderful Life” and lined it up for Christmastime 1978. The quality of the 16 mm film wasn’t as good as they would have liked, but the screenings were popular, and the Naro kept showing it every year. In the 1980s, the movie fell into the public domain because of copyright issues, and that’s when it started to be shown frequently, some might say relentlessly, on TV stations every year. Vourlas said the video quality was often shaky, the movie was sometimes edited, and the commercials were disruptive. The Naro found a higher quality, 35 mm print to give their screenings an edge. The theater got a further edge when the company they got their print from went out of business, so they had nowhere to send it or return it to. That meant years in which they didn’t have to pay anything to screen it, Vourlas said. Thanks, Clarence! The Naro screenings and the surge in national popularity of the film went hand in hand. By the end of the 1990s, Paramount had gained control of the film. Now, it’s shown on TV sparingly. (It will air on NBC on Christmas Eve.) But you can still see it in big-screen glory at the little old Naro, Vourlas said. Vourlas said he would get a kick when Naro audiences noticed and reacted to the juxtaposition. He also loves when somebody comes in who has never seen the film before. Dan Duke directs arts and entertainment coverage and the Flavor section. He has been with The Pilot since 1994, combing work here with fun as, at various times, a Cub Scout den leader, youth soccer coach, writing teacher and amateur musician.